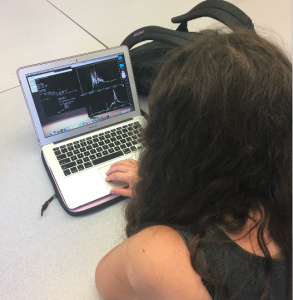 This project focuses on characterizing the structure of the Martian bow shock using data from the Mars Atmosphere and Volatile EvolutioN mission (MAVEN). I am investigating the structure of the density, velocity, and magnetic field across the shock, as observed by MAVEN and fitting simple functions to the profile of the shock. The end goal of the project is to develop a computer algorithm to fit simple functions to bow shock profiles. I am extending my research project with Professor Jasper Halekas at the University of Iowa, which was previously started under the ISGC 2016-17 scholarship. I am continuing to write an automated code to analyze the Martian bow shock by fitting curves to the data. My current code fits simple step functions to the bow shock profiles by using residuals as a means of determining the best fit. However, I am aiming to add onto the code in order to use more complex fittings with methods such as Fourier Transforms. The fitting technique will be applied to many orbits in order to statistically determine the structure of the bow shock, and will produce valuable information on how it varies as a function of solar conditions. This second half of the project will focus on increasing the complexity and accuracy of fits, as well as making the code more versatile for data analysis.